You have added Feels Like A Fairytale Button Front Bell Sleeve Teal Dress into shopping cart. This cute boho dress has so many details we love--from the bell sleeves to the button front to the crochet band around the waist! The Feels Like A Fairytale Button Front Bell Sleeve Dress is fully lined, except at the crochet lace panel, which is semi-sheer. It is made of a flowy fabric and has a V neckline, three quarter bell sleeves, and a flowy cut. A row of fabric covered buttons down the front adds to this flirty look and a panel of semi-sheer crochet lace gives it a bohemian touch. The Feels Like A Fairytale Button Front Bell Sleeve Dress would look perfect dressed down with gladiator sandals and a boho headband for a laid-back look. You could also dress it up with wedges or heels. This is a cute dress that will garner many compliments! Details: Lined except at lace waistband. 70% silk, 30% polyester. Lining: 100% polyester. Hand wash cold water separately. Color will bleed. No bleach. Hang to dry. Small measurements: Length from top of shoulder to hemline: 35". Bust: 32". 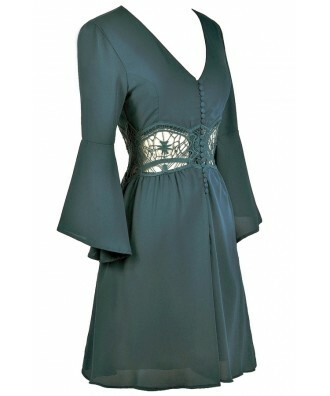 You have added Feels Like A Fairytale Button Front Bell Sleeve Teal Dress into Wishlist. You have added Feels Like A Fairytale Button Front Bell Sleeve Teal Dress for Stock Notification. You have set Feels Like A Fairytale Button Front Bell Sleeve Teal Dress as a loved product. You have removed Feels Like A Fairytale Button Front Bell Sleeve Teal Dress as a loved product.